← Queen – She Makes Me. 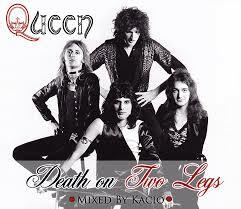 Queen – Death On Two Legs. Publicat pe 15 iunie 2015	de Cristi M.
Queen’s last album featuring Mercury, titled Made in Heaven, was finally released in 1995, four years after his death.Featuring tracks such as „Too Much Love Will Kill You” and „Heaven for Everyone”, it was constructed from Mercury’s final recordings in 1991, material left over from their previous studio albums and re-worked material from May, Taylor, and Mercury’s solo albums. Both stages of recording, before and after Mercury’s death, were completed at the band’s studio in Montreux, Switzerland.The album reached No. 1 on the UK charts immediately following its release, and has sold 20 million copies worldwide.On 25 November 1996, a statue of Mercury was unveiled in Montreux overlooking Lake Geneva, almost five years to the day since his death.